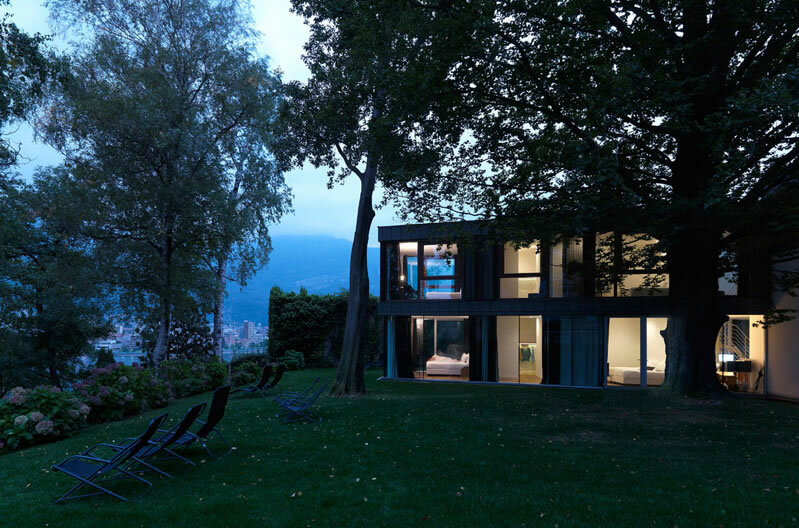 Located down the road from Bellagio just opposite Lecco, Casa sull’Albero in Malgrate is an exclusive property perfect for guests looking for a private boutique hotel on Lake Como, Italy. A balance between luxury and understatement with a focus on sustainability. While looking for accommodation for family, I went to see the delightful Casa sull’Albero in Malgrate. Casa sull’Albero means “treehouse”, but it is so much more than that. This boutique hotel overlooking the Lecco branch of Lake Como is an eco-sustainable house made of glass and repurposed wood. A sleek and modern design not at all intrusive to the surrounding landscape and park. The large, handsome tree in the garden provides a sense of natural security and beauty. The rooms look out to the park and lake. The handsome tree offers shade and protection. I was let in the front security gate and walked down the long boardwalk made of local, repurposed wood. The silence and the smell of freshly cut grass immediately melt away your worries. The garden is off to the left, and through the glass windows on the right, you can see a small pool and outdoor sun deck.The calm and peace are preserved by a soft-spoken receptionist who greeted me with a smile. I explained the purpose of my visit and was introduced to Fabio Datati, managing director of the hotel. He kindly gave me a tour of the guesthouse, showing me the room options. I think it would be very difficult for guests to choose between the garden view and the upper-level lake view and treetop rooms. There are 12 rooms, each has a unique view and the glass walls immerse the guest in the scenery. On the upper level, it feels as if you are truly in a treehouse, and on the lower level, it feels like you are in the garden. Some rooms are more spacious than others, all with newly refurbished bathrooms. The decor is minimalist yet warm and inviting. There is also a breakfast room and snack bar, cinema/meeting room, library, sauna and massage area. Use of the gym in their sister hotel Promessi Sposi, down the footpath, is also available to guests. During our chat, I discovered that Mr. Dadati and I share a common interest in sustainable tourism and the idea that both private and public entities have a role in creating a balance that benefits both the community and the visitors. He explained, “We stock our kitchen with local foods, cheeses and products, supporting local producers. Even the beer is made locally. We exhibit the work of local artists and designers and we use environmentally friendly cleaning products. We try to take steps to respect nature and the environment.” They also encourage their guests to explore the towns and villages offering bike rental and there is a free Tesla charging station for electric cars. The Casa sull’Albero is a private and exclusive property. They aim to pamper guests and make their visit to Lake Como memorable. The hotel doesn’t have a restaurant, but private dinners with a personal chef can be arranged as well as other exceptional experiences like boat tours, horseback riding, golf, and romantic weekend specials. It would also be a unique location for an intimate destination wedding. Although I only visited as an observer, the hospitality I received during my visit was genuine and welcoming. Located in the lakeside town of Malgrate, twenty minutes from Bellagio and just across the bridge from Lecco. The road to Milan and Bergamo is easily accessible. Car service is also available if you are traveling by plane or train.